When considering the intricate movement of the solar system, and the seemingly consistent patterns produced, it looks like a working clock of biblical proportions. There is no question that the spherical pattern of rotation, which is even noted at subatomic levels in creation, can produce a reliable means of telling time. Days, weeks, and months are easily observed to move in this pattern of rotation. With the going down of the sun, or more technically, the spinning and rotating of the earth around the sun, we see a new day begin. Biblically this is the start of a 24 hour day. The end of a day is also at sunset. The Bible tells us from creation that the weekly pattern is made up of 7 days (each having a nighttime and daytime), with the 7th day being designated as holy from the other 6 days, Gen 2:2-3. The months are also a set pattern, in which we find either the 29th or 30th day as the complete rotation of the moon (with its phases, having come around the earth). The visible crescent, just past the astronomical new moon or conjunction (molad) phase, is viewed in the western sky just after sunset. There is basically a 29 ½ to 30 day pattern to follow. “At a very early date, mankind would have had at its disposal accurate knowledge of both the moon’s phases and the length of the year—enough to devise a workable calendar, one might think. However, that’s where the real difficulties began. The intrinsic problem with all calendars is that our superficially harmonious solar system is actually a complete jumble. “One revolution of the earth on its axis makes a day, but 365 of these revolutions are not equal to the time it takes for the earth to orbit around the sun (i.e., one year), which amounts to 365.242199 days. Likewise a lunar month is not a round figure—it is actually 29.53059 days. And while there are roughly twelve lunar months in a year, they add up to only 354.36706 days—eleven days short of the solar year. Egypt was known to have had at least two calendars at one point, and they were used side by side. It has been noted that they kept both calendars due to the reverence they had for venerable objects of worship. They would just continue to update them, as needed. The first Egyptian sun calendar of 360 days (12 X 30 day months) ran into problems with the seasons getting out of alignment. They helped the problem by adding on five days each year. Adjustments like this seem to be the practice of most every civilization trying to come up with an accurate calendar. “In ancient China the surviving ‘oracle bones,’ used by the rulers of the Shang Dynasty to foretell the future…show that the Chinese had a Lunar calendar similar to that of the Sumerians…Later on, the importance of having a reliable calendar grew after it became tied to astrology, and one of the emperor’s prime responsibilities was to ensure that the calendar was running accurately. Accordingly, around a hundred calendrical reforms were initiated by the imperial court,” Ancient Inventions, by Peter James and Nick Thorpe (1994), page 490. Societies, while coming up with some viable calendars through trial and error of determining the movement of the sun, moon and stars, were chained to the belief that they could foretell the future while giving homage to the sky deities they worshiped. “The earliest known account of the use of astrology comes from ancient Sumer, a region in the lower Euphrates river valley. The Sumerian Gudea cylinders contain an account of a dream of King Gudea in which the goddess Nidaba came to him holding a tablet inscribed with a map of the heavens. The dream indicated that it was a propitious time for Gudea to build the Eninnu temple. Eclipses were eagerly predicted because of their bad omen against kings. It is said that substitute kings would be placed in office during those times to prevent any harm to the real king. Comets were also seen as bad omens for the people. Both the pre-Israelite nations of Egyptians and ancient Babylonians could divide the heavens into a type of zodiacal chart to find bad omens and other signs, via the ecliptical pattern of the sun, etc. Does the Bible point to such a known chart? We know that Job had knowledge of certain star constellations (Job 9:9), otherwise Yahweh would not have addressed Job in the way He did (Job 38:31-32). With the exception of Orion, in some charts today, it seems the ancient zodiac charts lack the three constellations both Job and Yahweh mention. Historically, Babylon had stockpiles (thousands upon thousands) of clay cuneiform tablets, which seems impressive, but doesn’t really tell us what the ancient Israelites did. It is noteworthy to point out that the earliest zodiacal charts from the Sumerian culture had six divisions of constellations, with two seasons, spring and fall. Babylonian charts had 18 and 12 divisions, at different times, but seemed to keep with the seasonal patterns of twos. Assyria, further north, had three. Egypt’s civil year seems to also have had three, based upon the Nile’s annual water levels of flooding, absence, and flow. Some ancient zodiacal charts have been found with 13 animal type constellations within them. The animals were all worshiped, just as the sun and moon were. Yahweh also directed the seventh day as a day of rest in the book of Genesis, but then no other details are given until the book of Exodus. Are there more details about the biblical calendar (the one Yahweh wanted Israel to use) later in Scripture? Could Yahweh have chosen a slightly different means for Israel since they were to be separate from the other nations, including the one they just came out of, who were using these types of pagan calendrical systems? “…lest thou lift up thine eyes unto heaven, and when thou seest the sun, and the moon, and the stars, even all the host of heaven, shouldest be driven to worship them, and serve them, which Yahweh thy Elohim hath divided (given) unto all nations under the whole heaven,” Duet 4:19. It’s no secret, ancient societies, stemming long ago from Sumra (alternative spellings: Sumer or Sumur) and Akkadian civilizations, literally worshiped the sun, moon, and stars. Ur, located in the lower area of Sumra, at the northwest end of the Persian Gulf Sea, is the city of the moon deity where Abram was originally called out from. It was also known later, at least by the Egyptians, as “The city of the Sun,” The Armana Letters (EA 67 Notes), by William L. Moran. “Annukaki (the gods of the high sky)” is referenced in the Babylonian Code of Hammurabi. Pagan worship of the heavens along with foretelling the future (divination, astrology) was prevalent in ancient times. It was so bad that the Pharaohs (kings) of Egypt, themselves, were being worshiped as deities from the start of their reign. Regrettably, even among Israel, there were those willing to prophesy falsely and accept false idols as their elohim, Isa 47:13, Ezek 8:6-16, and all of chapter 13. The religious people of those societies, other than Abram (whose name became Abraham), were made up of astrologers, rather than astronomers alone. In a sense, they were scientists, priests, astrologers and astronomers, all rolled up into one. The mathematical achievements made by the Babylonians were impressive. They even had the basic 60 minute hour timed out. In fact, they used 60 (sexagesimal) as a standard throughout their math calculations, just as we would use 10 (decimal) in ours. They would have known of the vernal equinox, too. pyramids all point to specific stars. They knew the planetary movements and they are said to have had the ability to determine the vernal equinox accurately. They could do this with Obelisks. Four-sided upright granite Obelisks were strategically placed in certain locations to honor the rising as well as the setting of their sun deity. 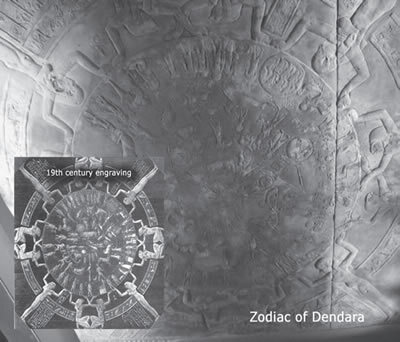 It has also been observed that they eventually put in stone what is called the Zodiac of Dendara (found on the wall of an Egyptian temple - see photo) which was evidently used as horoscopes are today. It’s now housed in the Museum of Louvre located in Paris, France. These "Easter-n" pagan ways go back to Babylon and the ancient Sumerians. Ezra and Nehemiah, after returning to Jerusalem from Babylon, taught Yahweh’s law and kept the 7th month Feasts. Many of Judah, however, stayed behind in Babylon. The captivity of 70 years had brought up a new generation that assimilated into the lush Babylonian lifestyle. They just didn’t feel a need to leave it. Judah, under Ezra and Nehemiah, continued using the Babylonian names for the months, but that is not proof they accepted the zodiac chart as their guide. We ourselves reference calendar names today to communicate, but also recognize that they are out of sync with the pattern Yahweh gave Moses. The Babylonian months were close in comparison, but not always exact. “…he put down the idolatrous priests, whom the kings of Judah had ordained to burn incense in the high places in the cities of Judah, and in the places round about Jerusalem; them also that burned incense unto Baal, to the sun, and to the moon, and to the planets (constellations), and to all the host of heaven,” 2 Kings 23:5. If only they had maintained their proper worship of Yahweh. But (just 2 ½ years and four bad kings later) after Josiah’s reign, backsliding Judah went into captivity under Babylonian rule. It’s a lesson for us today not to turn away nor backslide into a former sinful lifestyle. The Mayan temples and culture are said to have produced one of the most accurate calendars of all the ancient societies. Their 365 day calendar was quite remarkable. The Mayan priests would go to the top of their ziggurat type stair stepped temples at night for astrological observation, while during the day, the sun would (because of the skylights at the top and sides of the top part of the temples) mark its path along the upper floor. 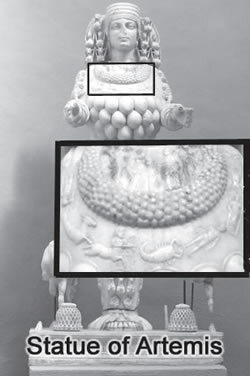 Their temples were all positioned in the same direction, even those in distant areas away from each other, and streets are all noted to be paralleled one to another. They were quite ingenious in their abilities; they were methodical in their planning; they had a fundamental knowledge of both trigonometry and geometry. However, as with all the other ancient societies with knowledge of astronomy, they had pagan beliefs and were basically prognosticators. They were astrologers. In fact, they’ve given the winter solstice of December 21st, 2012, as the time when the world will change abruptly. Some think this will be the time when humans will shift in consciousness to the "next level," a type of evolutionary advancement. Many other cultures have come to the similar erroneous conclusions and offer 2012 as a very significant year of inception or transition. Interestingly enough, many of these “advanced” early societies also have a winged serpent portrayed within their cultural ruins. One can draw their own conclusion why that is, but no doubt the devil is in the details, influencing mankind in a negative way from the beginning. The Mayans will be remembered for their sun calendar (the calendar that abruptly ends on December 21st, 2012), but they’ll also be known as the people who would cut the beating heart out of a person to hold up to their gods as well as sacrificing their own children for similar reasons. Their erected temples seem to have dead children’s bones buried on each of the four corners. Is it any wonder Yahweh wanted His People Israel to be separate from these other nations? As advances occurred in the Hellenistic era, with less horrendous paganism and a more astronomical mindset, devices such as the Antikythera Mechanism were made possible. This mechanism with an estimated 29+ moving gear wheels (evidently for determining calendrical information), made around 150 100 B.C.E., was quite the technology back at that time. Another device, with Greek lettering, is the Byzantine Sundial- Calendar (roughly 500 C.E. ), which has only 8 gear wheels, but is able to provide dates by positioning the sun and moon among the zodiac. Similar astronomical calendars were created by individuals like Abu Said al-Sijzi around 1050 C.E. More astronomical clocks were made during the times of medieval Europe. A little known fact is sea voyages, by the stars, led to a navigational need for the invention of precise time pieces. Competition and rewards for such a reliable timepiece led to the accurate watches we have today. Besides having accurate watches, we now have other things at our disposal, such as the United States Naval Observatory (USNO) which gives us extremely detailed information when looking to calculate a calendar. But with all this technology, we can still do better by following Yahweh’s way of doing things. Scripture tells us Moses was trained in all the wisdom of Egypt, Acts 7:22. He already would have known when a new year started according to Egyptian reckoning. Why would Yahweh tell him “this month,” if Moses already knew it was the “beginning of months"? One gets the distinct impression this was something new for Moses and for all of Israel. We know Yahweh has a way of separating the clean from the unclean, Lev 10:10. The question is, is that what He did here? “For Yahweh is not the author of confusion, but of peace, as in all assemblies of the saints,” 1 Cor 14:33. “A lunar year of 12 months was approximately 11 days shorter than the solar year, so additional days were inserted to make up for the difference. The practice of insertion, known as intercalation, was a device common to several lunar calendar systems. The ancient Chinese compensated by adding an intercalary month every 30 years to their calendar, which consisted of 12 months of 29 or 30 days each. The Muslim lunar calendar, still used throughout Islam, also recognized 30 years as a cycle. Beginning with the second year within each cycle, and at subsequent intervals of three years, a “leap year” (a year of abnormal length) is observed. In that framework a leap year comprises 355 days as opposed to the ordinary Muslim year of 354 days. Calculation of the ancient Hebrew year suffered the same problems as other lunar calendars.” – Tyndale Bible dictionary, Elwell, W. A., & Comfort, P. W. (2001), page 250. The conclusion that the “Hebrew year suffered the same problems” is wrong, because it assumes the vernal equinox was originally used by Israel to calculate the beginning of each year in which man made calculations or intercalations (adding days or months) would need to have been done to keep the seasons in their proper place within the calendar. The Israelites were given a new command to follow once leaving Egypt and entering the Promised Land. The evidence of the wave sheaf offering, which was required to be offered on the day after the weekly Sabbath which occurs during the Days of Unleavened Bread, is key to understanding what we are to be looking for in determining the beginning of the year which Yahweh designated for Israel, and therefore, for us today. We need to know the proper days, weeks, and months, to be able to keep His Holy Days properly and at their proper Appointed Times. Significantly, the barley was in the early milk stage of the ear, in the month of Abib, when it was destroyed by the hail event in Egypt, Ex 9:31-32. The barley must be in that early ear “milk stage”** to be able to be shaken or beaten slightly off the stalk, which could then be roasted on a fire for food. It would be the proper stage for harvesting and therefore presentable to the priests, Lev 2:14. “You shall not delay the offering from your harvest...,” Ex 22:29 NASU. The wave sheaf timing, and therefore the early search for it, allows the new moon shown at that time to be designated as the start of the new year. It is the “beginning of months.” Those months will typically be twelve in number, but occasionally a month will be added, when the wave sheaf arrives late. It is Yahweh’s doing and not man’s. Think about all the corrections man has done over thousands of years in trying to produce an accurate calendar. Yahweh allows and determines the late growth of Abib. He controls the weather by how much sun and rain the seeded ground gets, Ex 9:29, Zech 10:1. The sun is indeed part of the key, with its warmth measured out (technically known as “heat units”), in unlocking the opening mechanism of the seed. However, too many clouds, snow on the ground or cold winds blowing, and there will not be adequate warmth to unlock the growth. Rain, of course, is also needed. The point is this: vernal equinox timing is not always an accurate indicator for a wave sheaf of early ears of barley to be ready, since other weather factors play a part in the overall process. In examining all of this, we can understand clearly why Abib is the first month indicator, along with the new moon, Ps 104:19. What we are given in Scripture is an agricultural and lunar calendar. “This month refers to the time when the events of chapter 12 took place. It became the first month in the Hebrew calendar, which begins with the new moon appearing during the second half of March or the first half of April. It is not yet named, so translators should not give it a name here. But in 13.4 and 23.15 it is called ‘Abib.’ …Shall be is not in the Hebrew (literally ‘this month for you’), but ‘is’ or ‘is to be’ should be understood here. This is the announcement of a new calendar for the Israelites.” – A handbook on Exodus. UBS handbook series; Helps for translators (page 270), by Osborn, N. D., & Hatton, H. (1999). New York: United Bible Societies (used by permission). “You shall not do what is done in the land of Egypt where you lived, nor are you to do what is done in the land of Canaan where I am bringing you; you shall not walk in their statutes,” Lev 18:3 NASU. Yahweh has warned us not to be like the pagans and does make a distinction. “…Then you will know that Yahweh makes a distinction between Egypt and Israel,” Ex 11:7 NIV. Ex 13:4 “Ver 4—In the month Abib. The name of the month had not been previously mentioned. Some have derived it from the Egyptian Epiphi. As, however, ab means ‘greenness’ in Hebrew, and abib ‘green ears of corn,’ while ibba meant ‘fruit’ in Chaldee (Dan. 4:12, 14), and abbon means ‘green herbs’ in Arabic, there is no need of a foreign derivation for the word. The month of ‘greenness,’ or of ‘green ears of corn,’ would be both appropriate and intelligible.” – The Pulpit Commentary: Exodus Vol. I. (2004), page 299, by H. D. M. Spence-Jones, Ed. The cyclical agricultural pattern we find in the Abib, and later harvests going into the fall, show us Yahweh’s hand in creation. A pattern He can adjust with the weather, so as to have Abib show early or late according to His will. In following this pattern, there is no risk of being disobedient to Yahweh’s time table of events throughout the year. Making sure Abib was observed by Israel in ancient times would assure that the fall harvest would be brought in before the Feast of Tabernacles was to be kept, Lev 23:39. Therefore, they would have plenty of 2nd tithe (Deut 14:22- 26) for the Feast of Tabernacles and they wouldn’t need to worry about an upcoming harvest. It would already be taken care of since the wave sheaf command and timing was kept according to Yahweh’s word. They could then freely rejoice before Yahweh during the Feast, as commanded, Lev 23:40. Since Israel was an agricultural society, it would have been second nature for them to do this each year. Today, we have Scripture as a standard for calculating and observing Yahweh’s time-table for the whole year. With Yahweh’s calendar there is no guess work, if we just keep His commandments in mind. We only need to know when there is enough barley for a wave sheaf in Israel. We know that the new moon after it is the beginning of months, i.e., the new year. A land which Yahweh thy Elohim careth for: the eyes of Yahweh thy Elohim are always upon it, from the beginning of the year even unto the end of the year, Deut 11:12. The land of Israel is indeed identified as Yahweh’s Holy Land, Zech 2:12. A land to which we look for the early ears (Abib) of barley. It’s the spring harvest; the first harvest, in which, both Messiah (the Wave Sheaf) and the brethren in the first resurrection (the first fruits) are alluded to. The wave sheaf is rich in symbolism for Yahshua, the Messiah (the First of the first harvest). He is, as is the wave sheaf, the “First of the first.” This is exactly how the wave sheaf is described in Scripture. “…now is Messiah risen from the dead, and become the firstfruits of them that [sleep]… every man in his own order: Messiah the firstfruits; afterward they that are Messiah’s at His coming,” 1 Cor 15:20, 23. This is basically saying that those who are dead (asleep) in Messiah will be raised up to eternal life at His return. Those that have never died, but are living at His return, will not be changed to Spirit beings until the dead in Messiah are raised first (see also 1 Thess 4:15-17). This should not be a long process, but once the dead in Messiah are raised, then those who never died a first death (those alive at the end of the age) will be changed to pure spirit. To put it bluntly, this will be a mind-blowing experience for all involved. Yahshua was accepted for us, and now He is the High Priest in heaven interceding and mediating on our behalf under the Melchizedek order, Heb 9:11 . “Blessed and holy is he that hath part in the first resurrection: on such the second death hath no power, but they shall be priests of Elohim and of Messiah, and shall reign with Him (on earth, Rev 5:10) a thousand years,” Rev 20:6. Yahshua is also noted as being the “beginning and the end,” Rev 22:13. If we relate that to the timing of the year with the wave sheaf, we may gain further insight. “Although the month in which the autumnal equinox occurs is first in sequence according to solar orbits, it is not considered first in the law (page 582)…He lived his entire life in Alexandria, Egypt, the location of the single largest Jewish community outside of Palestine in this period…So far as is known, Philo visited the temple in Jerusalem only once in his lifetime (page 4).” – The works of Philo: Complete and unabridged, Philo, o. A., & Yonge, C. D. (1996, c1993). Philo no doubt knew of the solstices and zodiacal reckonings in Egypt, but we know from historical records and archeological evidence that it goes back to paganism. Ancient Egypt, as we’ve already seen, was also a major pagan influence, worshipping their own Pharaohs as deities. It’s interesting that Philo, according to the historians, never really seemed to put forth effort to keep the Feasts in Jerusalem while the Temple was standing. However, we recognize there was a prohibition against Greeks going beyond a certain area (Court of the Gentiles) within the Jerusalem Temple area. Another group at the time of Messiah, called the Samaritans (thought by some to be at least a partial remnant of the lost 10 tribes of Israel, 2 Chron 34:9; John 4:12), were also forbidden to enter the Jerusalem Temple area. Therefore, they built their own Temple to Yahweh on Mount Gerizim. It was destroyed in 128 B.C.E. After the destruction of the Jerusalem Temple in 70 C.E., everyone was left to fend for themselves as the Sanhedrin lost control. Items, such as the calendar, were now up for grabs. It is reasonable to think, since the vernal equinox timing is often in agreement with when Abib shows, that there is not much controversy. This probably was the case the year Yahshua kept Passover with His disciples. It’s important to understand if Yahweh decides to delay the growth of the early ears of Barley, then there’s a major problem. The problem being those keeping vernal equinox would not be able to obey the command to offer a wave sheaf offering at the correct time. The point may be considered moot by most, since we don’t offer a wave sheaf under the Melchizedek Order. However, we are to keep the Feast Days at their proper times. When they are to be kept is as important as how they are to be kept. There is no detailed information concerning the vernal equinox in the Bible. Think about it; not even the attempt to use a Hebrew word like tequphah (Strongs # 8622) – a cycle or closing of time, such as a 9 month gestation period, 1 Sam 1:20 – explains advocating the promotion of a vernal (spring) equinox. While on the other hand, detailed timing and offering of the wave sheaf is absolutely clear in the Bible. It is a simple concept that if the wave sheaf command is followed, it will always give the correct timing for the beginning and ending of each year. It’s interesting to note the vernal equinox was made law within the Catholic Church for reckoning their Easter celebration. Their anti-Semitic viewpoint is also noted which further alienated them from Judah and anyone else that kept Sabbath, Feasts, etc. “In the course of the third century the Roman practice gained ground everywhere in the East, and, to anticipate the result, was established by the council of Nicaea in 325 [C.E.] as the law of the whole church. This council considered it unbecoming, in Christians to follow the usage of the unbelieving, hostile Jews, and ordained that Easter should always be celebrated on the first Sunday after the first full moon succeeding the vernal equinox (March 21), and always after the Jewish Passover. If the full moon occurs on a Sunday, Easter-day is the Sunday after. By this arrangement Easter may take place as early as March 22, or as late as April 25.” – History of the Christian Church, Schaff, P., & Schaff, D. S. (1997). The dehioth (postponements), seen in the Jewish calendar and implemented by Hillel II (2nd) around 359 C.E. to keep Sabbaths from falling back to back, is not justified by Scripture. In this case, and many others, the end most certainly does not justify the means. They tie up heavy burdens and lay them on men’s shoulders…, Matt 23:4. The confusion and burden in the numbers is also evident by looking at the short history of the Julian into the Gregorian calendar of 1852, which ended up making a 21 day month in October of 1852. “Julian and Gregorian Calendars. Sweeping reforms in the Roman calendar were instituted by Julius Caesar in 44 b.c. with the help of Sosigenes, a Greek scholar who based his solar calendar on a year of 365¼ days. Although the radically transformed calendar ended much confusion, its year was about 11 minutes longer than the true solar year. Since the Julian calendar was used for more than 15 centuries, that tiny error eventually produced gross discrepancies. Bede, an 8th-century English monk and historian, and Roger Bacon, a 13th-century English Franciscan friar and scientist, were among those who reported on the problems of the Julian calendar. By a.d. 1580 the equinoxes were falling 10 days earlier in the year than they had in 44 b.c. “By 1582 the errors of the Julian calendar were deemed too great to tolerate; in that year Pope Gregory XIII issued a decree abolishing the ancient calendar. In its place he substituted what is commonly known as the Gregorian calendar. At first, few countries beyond the influence of the papacy accepted the new calendar. Some resisted the changeover for centuries. Britain, for example, refused to adopt the Gregorian calendar until 1752, Russia until 1918, and Turkey until 1928. “Gregory’s edict took effect in October 1582. In that initial month the 5th day was designated the 15th, thereby compensating for the loss of the approximately 10 days from the Julian calendar. Simply stated, the Gregorian rule declared that a year whose number is exactly divisible by four would be a leap year, with the exception of century years (such as 1700, 1800, 1900, etc.) unless they were an exact multiple of 400 (such as 1600, 2000, etc.). In each leap year February would have 29 days instead of its normal 28. February in the Julian calendar had been shortened from 29 to 28 days by the emperor Augustus in order to add a day to his month (August)—to make it the same length as the month named for Julius Caesar (July)! The Gregorian calendar left the lengths of the months the same as in the Julian (as revised by Augustus).” –Baker encyclopedia of the Bible. Elwell, W. A., & Beitzel, B. J. (1988), page 400. Thought of as a student’s tablet, a stone tablet was found with Hebrew writing in the area of Gezer, a Canaanite dwelling that Israel went into and conquered (Josh 10:33) and was later kept as a Levitical city among Ephraim territory, Josh 16:3; 21:21. It is one of the first Hebrew writing examples to have been found. The tablet is referred to as the “Gezer Calendar” in most circles today. The interesting thing about all of this is: it acknowledges a lunar and agricultural connection, though evidently showing the beginning of the year in the fall. A seemingly unrelated section in Amos 7:1 (NIV) says, “This is what the Sovereign Yahweh showed me: He was preparing swarms of locusts after the king’s share had been harvested and just as the second crop was coming up.” Concerning the Hebrew word leqeš, “The term translated ‘the second crop’ (leqeš) occurs twice here but nowhere else in the Bible. In the Gezer Calendar the term leqeš designates the fifth and sixth months of the year. Since the list of months begins in the fall, the fifth and sixth months would be in March-April of the Western calendar.” -- The New American Commentary (Amos, Obadiah, Jonah) by Smith, B. K., & Page, F. S., page 128. The answer to why the Gezer tablet had the fall crop listed first may be due to syncretism. “Neither did Ephraim drive out the Canaanites that dwelt in Gezer; but the Canaanites dwelt in Gezer among them,” Judges 1:29. However, this is unlikely, since the tablet is early Hebrew writing. Alternatively, the tablet may very well have been a teaching to recall the harvests after the Sabbatical pattern, i.e., Atonement to Atonement (Sept/Oct to Sept/Oct) every 7 years, Lev 25:1-5. This may actually have some weight, knowing the Sabbaticals came into disuse (2 Chron 36:21), but would most likely have had some conservative teachers wanting to keep the commandment alive for the younger generation growing up. archeological evidence pointing to an agricultural and lunar connection in Israel’s history. The tablet dating (971-910 B.C.E), if correct, is to Solomon’s time in power. It should be pointed out that the zodiac and equinox reckonings are sorely missing in any of Israel’s history, unless you take a closer look to the creatures of worship on the walls described in Ezekiel 8:10 (592-570 B.C.E. ), which look to be like a description of zodiac type creatures we now find common in horoscopes today. It’s the same type of zodiac that is worn as a necklace by the famous pagan fertility statute of Artemis with the scorpion at the forefront. Notice also the scorpion being pointed to within the zodiac of the painting (La riforma del Calendrio) depicting the historical discussion concerning the correction of the Julian calendar by Pope Gregory XIII, in 1852. As Scripture says, “…there is nothing covered, that shall not be revealed; neither hid, that shall not be known,” Luke 12:2. There is more that could be considered, but we find a number of things when we look at ancient calendars. Most notably is the pagan connection among them. For us, we are to follow Yahweh’s word and not the devices or the fanciful star charts of men, Acts 5:29. 2. Yahweh’s instructions give us the timing of the wave sheaf. 3. Yahweh controls the weather, and therefore controls the calendar. 4. Following calendars with calculations, such as the vernal equinox, can put us a full month out of sync with the month of Abib. 5. The nation’s calendars over the years have had numerous manmade adjustments to become more accurate. 6. While recent advanced technology (e.g., USNO) and calculations (or intercalations) have served to give us an accurate means and timing of years with seasons kept in place, and without pagan worship, the simplicity of observing the biblical indicators for the time to keep His Holy Days gives us guaranteed accuracy. It also keeps us mindful of Him and His ways, rather than the world and its ways. 7. The zodiacal calendars with the divisions of constellations were clearly used for pagan worship early on in civilizations and are not found anywhere as instructions for Israel to follow. ** Correction: In determining when a biblical new year begins, it's important to consider Exodus 9:31, 12:2, 13:4, and Leviticus 23:10. In these verses, it has become obvious the fields (and not just a lone wave sheaf) should be in an abib state of growth before the sighting of the new moon.